For the first time ever… my name is in print, instead of disappearing behind a cloud of SEO or ghostwritten articles. Yay! Exciting! I hope it happens more often! 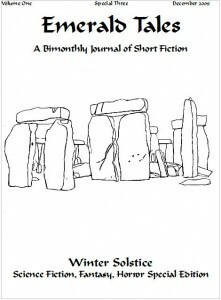 My story was picked up by the small press publisher Emerald Tales, and is available in their Winter Solstice Special Issue (scroll down to Volume One, Special Three) — which you can purchase on this page! The story is historical fiction, though since it’s set in ancient times it got slotted into the fantasy/sci-fi/paranormal/horror issue… which I certainly don’t mind! The tagline chosen for my story is: “A priestess does what she must to save her lover”… suspense! drama! conflict! ancient Babylon! You want to read it, right? But you might also be wondering… don’t I write novels? What happened to that? Well, it’s a simple explanation. Just this past summer, I decided to try my hand at short stories, as I thought it might be a good idea to try and build at least a few credits to my name before sending out larger pieces to agents/publishers… I want to prove myself in the small markets before going for the whole gamut with a novel, as it were. I’m not saying it’s the best route for everyone, but I felt it was something I needed to do (and need to continue to do) to not only build my resume, but also my confidence. And, it’s a great way to stretch those writing skills, because when it comes to short stories, every word must count. So, for those of you who go ahead and clicky-click to purchase the issue of Emerald Tales, thank you so much for your support! And for those of you who aren’t able to and prefer to offer encouragement in other ways, thank you for your support and encouragement too! It’s a great feeling to see your name in print, no matter how small the press, and I wish it wholeheartedly for the rest of you as well!!! Now… time to start racking up the rejections in 2010! We have a brand new year ahead of us, people, let’s get subbing! So, I was going to write something useful and interesting today, but I was struck by a curiosity-driven question. How did you feel the first time you submitted your work – be it an article, manuscript, query, whatever – to someone for publication? Over the weekend, I took the plunge and submitted something to a journal. It wasn’t great, and I know it wasn’t my best work, but I needed to break that psychological barrier of ‘not good enough yet’ and just get my work out there. After all, we writers need to amass a nice pile of rejection slips before the acceptances come in, right? And what better time to start than now? What I didn’t expect was how emotional the experience would be. It’s like… sending a part of your soul away to be judged & cast aside (because that’s what will happen, 99% of the time). Not only does it take courage to do what we do, but what normal person seeks out the rejection of something precious to them, over and over and over again? We writers are definitely not normal. When I hit “send” on that email & attached piece, it took all of 30 seconds before it hit me. My husband asked me some question about supper and I snapped at him, realizing only after I apologized that I’d just send a part of me out into the world for the very first time, and I broke down. Was it fear? Relief? Writer’s post-partum? I’m still not sure. I was excited and proud of myself that I’d sent something and actually made the deadline, sure… but what was it that caused such an outpouring of emotion? I’m still trying to figure it out, and I wonder if I’ll feel that way every time. What I’m really curious about is everyone else… what was your experience the first time you submitted something? Did you jump around the house with joy and excitement? Did you tremble with nervous fear? Did you settle down with a cup of tea and relax with a sense of accomplishment? We writers are strange types, and we all deal with the various stages of the writing process in different ways. So… let’s hear about it!